Jeanette Gonzalez lives on a mountain top surrounded in redwoods and sea air from a not-so-distant California coast. She shares her home with her husband, three children, and a slew of imaginary people who run her life when it’s not spent raising kids, eating, or sleeping. She studied English Literature at the University of California, Santa Cruz. Jeanette Gonzalez’s story “Serenity” was published in Metaphorosis on Friday, 15 July 2016. Subscribe to our e-mail updates so you’ll know when new stories go live. Q: Where do you do your creative work? A: Sketching can be done anywhere, except maybe on particularly shaky vehicles. For more polished pieces however, I’m chained to my desk and very reliant on my 27″ iMac and wacom tablet. 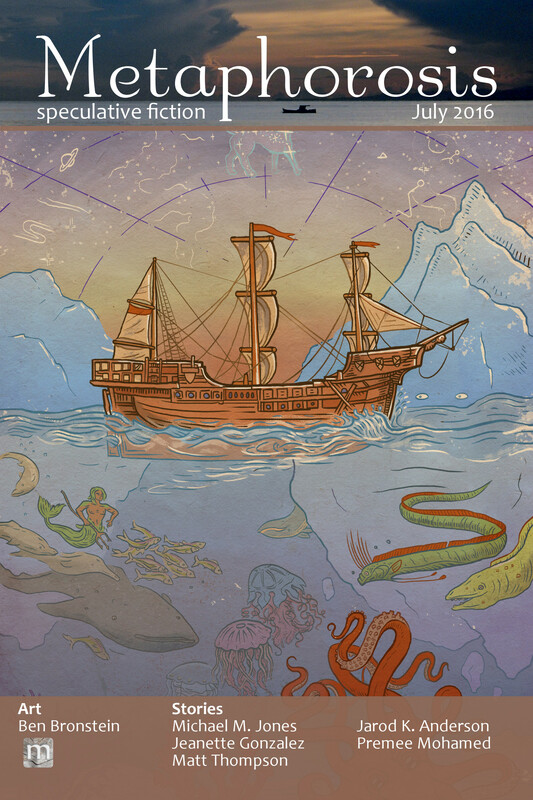 Ben Bronstein’s image “Thalassorama” is the cover art for our July 2016 stories. Q: Duckbilled platypus – result of divine distraction, or alternate universe crossover? A: Divine distraction–how else can you explain how freaking confused those things are? Michael M. Jones’s story “Regarding the Sainted Pirate Nicholas” was published in Metaphorosis on Friday, 1 July 2016. Subscribe to our e-mail updates so you’ll know when new stories go live. Formerly, Jarod taught English at a University in Ohio. Currently, he works to raise money for a wide range of college scholarships. He writes about education by day and ghosts, monsters, and magic by night. He lives in Central Ohio with his wife and two rescued pups. Jarod K. Anderson’s story “My Dog is the Constellation Canis Major” was published in Metaphorosis on Friday, 8 July 2016. Subscribe to our e-mail updates so you’ll know when new stories go live. A: Constantly. That is, I don’t consciously look to music for inspiration, but it helps me out all the same. I like to write (and read) with music on, and every now and then something will just jump out and suggest a story to me. Given that I’m not listening with my full attention, it’s a misheard lyric as often as not. Sometimes it’s a fragment of lyric that I repurpose. Either way, it goes down in the idea file for future use. The only time I consciously set out to work from a song was with my first ever story, “Blind”, written in the 1980s (published in 2011). It’s a very literal interpretation of the Deep Purple song by the same name. In slightly more recent days, I stole Brian Setzer’s title “Drive Like Lightning…Crash Like Thunder” for a pair of pulpy SF adventures, and a line from Fred Eaglesmith’s “Seven Shells” for a children’s story. Those artists give you a feeling for what I listen to: hard rock, rockabilly, and gloomy singer-songwriters. Throw in some classic country (Merle, Waylon) and some Euro-pop (Herbert Grönemeyer, Fiorella Mannoia), and that covers a lot of it. B. Morris Allen’s story “Adaptations to Coastal Erosion” was published in Metaphorosis on Friday, 24 June 2016. Subscribe to our e-mail updates so you’ll know when new stories go live. Ben Bronstein is an illustrator and advertising production artist based in Brooklyn, New York. When he isn’t drawing by hand or pushing pixels he’s most likely baking sourdough bread.